DVD Review: Happiness is… Peanuts: Go Snoopy Go! Hopefully someday we fans will get a complete set of all the Peanuts specials. It would also be nice to get the entire first and second seasons of The Charlie Brown and Snoopy Show in one package. For the time being, we are left with the Happiness is…series, the latest of which is Go Snoopy Go! The main feature here is It’s Spring Training, Charlie Brown and the B-side, as it were, is the 12th episode of The Charlie Brown and Snoopy Show, “It’s That Team Spirit, Charlie Brown” (mislabeled on the DVD menu as episode 13). It’s Spring Trainingis notable for having been produced in 1992, but not actually airing that year. The 35th prime-time Peanuts special was apparently deemed unworthy of broadcast. It eventually surfaced on VHS in 1996. Why was this? I guess the franchise was considered passé at that particular point in time. The main problem with the special is Judy Munsen’s oh-so-dated score. As with other Peanuts specials of this period, the late Vince Guaraldi’s classic jazz themes were nowhere to be heard. The drum machine-dominated, funk-lite muzak heard throughout Spring Training screams “early-‘90s” fairly loudly. The producers might have thought they were being “hip,” but the score ends up creating a weird, non-Peanuts-like atmosphere. What about the special itself? Well, it’s not bad at all. Charlie Brown rallies the troops for spring training – a bit early, seeing as heavy snow is still falling. Charlie and company make for a horrible team, exhibiting woeful incompetence during their practices. Lucy suggests they need uniforms. Charlie finds a sponsor who promises to provide new uniforms, so long as the team wins the season opener. The team’s unlikely secret weapon turns out to be pint-sized Leland. Worth pointing out is the awesomely bad sequence in which Franklin is saddled with a horrible rap song. It’s actually pretty funny in an unintentional way, with the rest of the Peanuts gang dancing along with him. Originally broadcast December 3, 1983, the included episode of The Charlie Brown and Snoopy Showfeatures an appropriate baseball theme for one of its shorts. Each episode of the show was structured as a series of shorter segments, so there are five separate bits found here. 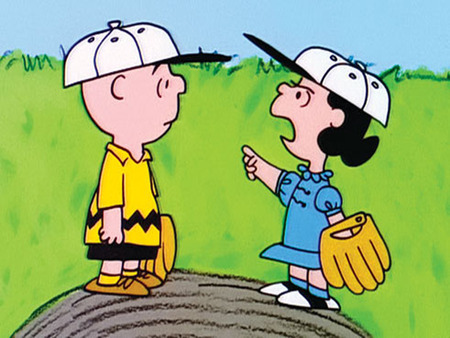 The best one is the baseball short, “Rainy Day.” It’s a very funny segment, with Charlie pitching and Lucy trying to instruct him from right field. She even provides him with a soup can phone, so they can communicate better – needless to say, that system doesn’t work out. Incidentally, unlike the fake hip-hop nonsense of It’s Spring Training, the jazzy music of Ed Bogas and Desirée Goyette does a great job of evoking the feel of the classic Guaraldi scores. Again, I hope someday we get a comprehensive collection of Peanuts specials. 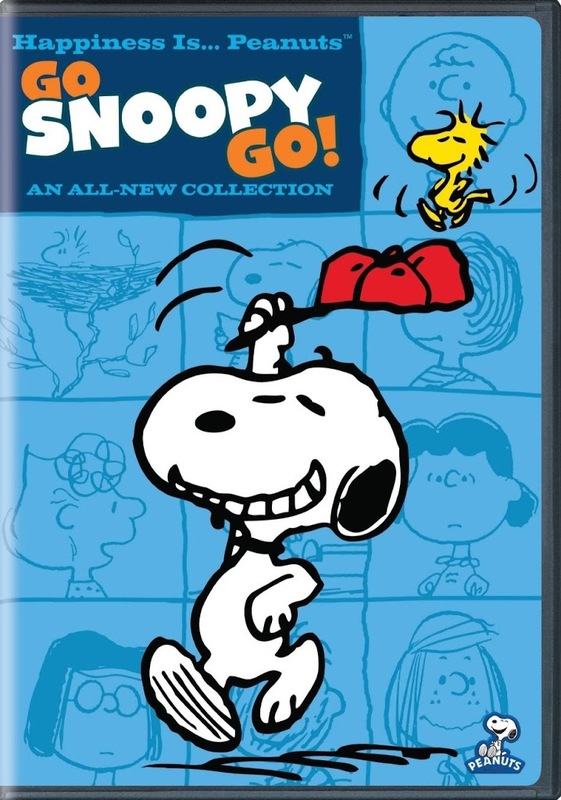 But in the meantime, Happiness is…Peanuts: Go Snoopy Go! is another solid, budget-priced release that will be fun for fans of all ages.